Erythropoietin is produced naturally in the body, mostly by the kidneys. It gives bone marrow the signal to produce red blood cells (RBCs), which carry oxygen in the blood. If the body does not produce enough erythropoietin, severe anemia (lack of oxygen reaching the different parts of the body) can occur. 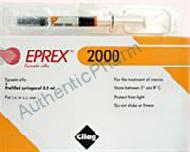 Eprex is synthetic erythropoietin (EPOetin alfa) and is used to replace the erythropoietin that is lacking in people who can\'t make enough, usually because their kidneys are not working properly. It is also used to treat anemia in cancer patients, certain surgical patients, and patients with HIV who are taking the medication zidovudine. It can also be used to increase RBC production in certain patients scheduled for surgery. It takes at least two weeks for a noticeable response to the medication, and can take as long as six weeks. Your doctor may have suggested this medication for conditions other than the ones listed in these drug information articles. If you have not discussed this with your doctor or are not sure why you are taking this medication, speak to your doctor. Do not stop taking this medication without consulting your doctor. Medicines and their possible side effects can affect individual people in different ways. The following are some of the side effects that are known to be associated with this medicine. Because a side effect is stated here, it does not mean that all people using this medicine will experience that or any side effect. Skin rashes Cold or flu-like symptoms Dangerously high blood pressure (hypertensive crisis) Rise in blood pressure Blood clots in the blood vessels (thrombosis) Increased numbers of platelets in the blood (thrombocytosis) The side effects listed above may not include all of the side effects reported by the drug's manufacturer. For more information about any other possible risks associated with this medicine, please read the information provided with the medicine or consult your doctor or pharmacist.